I’m a sucker for a great deal on firearms, and my local gun shop knows this. They are always putting guns in my hands. One really caught my attention: the Savage Arms Axis chambered in 30-06. That is one of my favorite big game cartridges. I don’t get out and do a lot of hunting these days, however when I do, its usually for deer, or black bear, and my all-time favorite caliber is .30-06. It’ll get the job done – every single time – with the right bullet placement, and the right bullet. I completely missed hunting this past year in Oregon, I was so busy with articles and testing products that hunting season passed me by. I was hoping to get some venison canned and jerked, but it just didn’t happen. The .30-06 round has now been with us for more than a century, and it is a favorite of big game hunters all over the USA. It’s a proven round from being used in world wars, to being used as a sniper round, to target shooting and of course, hunting big game. I spent a little time up in a Native Village in Alaska, as a police officer, and found that most of the population sported some kind of modified military rifle – Enfield in .303 – from WW2 – or a 30-06 for their moose hunting – two good choices if you ask me. I personally just like going out and doing some target shooting with one of my .30-06 rifles – it won’t beat me to death like many of the magnum calibers will. An often overlooked rifle is the Savage Arms Models – in various iterations – but lately it seems like the Model 110 and Model 111 are the hot sellers. Then we have to distinguish if it is an Axis or an Axis II model. The biggest difference between them is that, the Axis II has the user adjustable trigger pull, the Axis doesn’t. You can get an Axis with a decent trigger pull, or one that is heavy. In the case of the Axis I got from my local gun shop – used – it was a like-new rifle, with a camo stock, and came with a factory mounted Weaver 3-9×30 scope, and it had a horrible trigger pull – it was at 7-lbs – it felt stiff. Then again, I got the gun for only $225– so I wasn’t too worried about the heavy trigger pull. That could be corrected. The Axis is a bolt-action rifle that comes in various calibers. It has a matte black barrel and receiver, and has a nice camo stock. The barrel is only 22-inches and the gun is fairly light-weight at 7.3-lbs. It has a detachable 4-round magazine, and the overall length is 42.5-inches. There is a recoil absorbing pad on the end of the stock, that worked quite well, too. Not that I’ve ever found the .30-06 recoil all that punishing. All in all, I was very pleased with my purchase. I checked the Savage Axis over and found it was solid. So I cleaned the barrel, and headed out to the range for some shooting. On my second round, something happened to the scope, it was all fuzzy – not a good time. I headed back to the gun shop the next day, and they examined the scope and replaced it with a better one, at no-charge to me. So, I’m sure they lost money on the deal–but they back-up any guns they sell. Back to the range, and I had a good variety of .30-06 ammo from Black Hills Ammunition to shoot through my prized used gun. I had their 150-grain Hornady GMX, 168-gr Hornady Match Hollow Point, 180-gr Barnes TSX, and their 180-gr Nosler Accubond. I’ve always felt that the .30-06 performed best with a bullet weight between 165-grain and 168-grain when it comes to accuracy. Once I got the new scope zeroed-in, and it was already close, I started some shooting at 100-yards. Well, don’t ya know it, with the heavy trigger pull, no matter how hard I tried, I was only getting groups around 3 inches – this is not acceptable with a Savage rifle, they are well-known for their barrels and super-accuracy. I knew I could bring the trigger pull weight down, but it is one of those jobs that requires trial and error – sometimes I can do a trigger job in 15 minutes, other times more than an hour or longer. I wasn’t in the mood to tackle any gunsmith work on this rifle, so I did some research on the ‘net and found a company called M-CARBO, and they promised a simple drop-in assembly that would really give a great trigger pull. 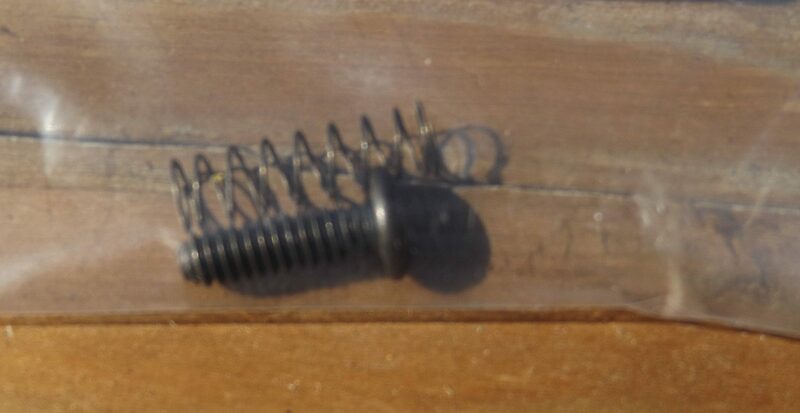 However, when I looked at the trigger job on their website, it only showed a screw and a spring – $15.95 – wait, that much for a screw and a spring – can’t be, won’t work, not even! However, I ordered up the kit, and assumed I could return it if it didn’t work – said so on their web site. Fast shipping, got the kit in a couple of days…I examined the screw and spring – I just knew it wouldn’t work, it was too simple, even for my feeble mind. I’ve done a lot of trigger jobs on firearms when I was doing gunsmith work, but just changing a screw and a spring? It wasn’t going to work, but looking over things, it was a 5-min job – what did I have to lose? Removing the barreled action from the stock – two screws – hmmm, that was too easy. Then removing the factory trigger screw and spring – another minute or two – wait, that’s too easy, too. Took me a couple more minutes to install the replacement parts, and put the action back into the stock. All too easy. I tried the trigger pull – hold on, wait, what, huh? The trigger pull was a whole lot lighter. I measured it – it was dead-on at 3.5-pounds. I was thinking: That can’t be right, not when I thought about the original 7-pound trigger pull. I dry-fired the Savage for a few minutes, and the trigger pull was outstanding. Next day, I was back at my rural mountain range – where a lot of people shoot – hardly ever find anyone there – in several years, I’ve only run across people there shooting twice. I love it. Set my target back at 100-yards once again, and commenced shooting the outstanding .30-06 ammo from Black Hills Ammunition. I walked out to my target stand, and couldn’t believe what I was seeing – I measured the group from the 150-gr Hornady CMX ammo – right at a shade over an inch. I fired several more groups, and they were all right in there. Wow! I then placed several targets on the target stand, so I wouldn’t have to be walking back and forth, and tested the other Black Hills ammo samples I had on-hand. I was getting groups right at one inch, so long as I did my part. When it was all said and done, best groups of the day, were with the Black Hills 168-gr Hornady Match Hollow Point, it was ever so slighting under an inch – with a used rifle, with an inexpensive scope on it. What more could I ask for in a $225 hunting rifle, chambered in .30-06? 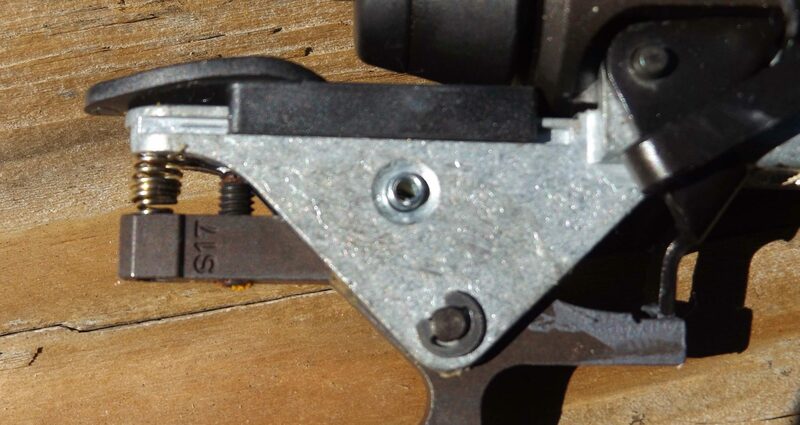 This article wasn’t so much about the Savage Axis itself, as it was about the drop-in trigger pull reduction “kit” that consisted of a screw and a spring. I was impressed, to say the least, and I’ll be on the lookout for another Savage Axis – I have a Savage Axis II in .30-06 and I have the trigger pull adjusted right at 3.5-lbs – same as on the used Axis that I bought on the cheap. Don’t pass up a nice used rifle, just because the trigger pull isn’t what you want. There are often off-the-shelf solutions that are easy to install, and inexpensive. If you’re in the market for a good trunk or truck rifle, then check out your local gun shop’s used gun inventory. BIG fan of Savage rifles here. I don’t have any of the Axis models but have a LRP in .243 and a .223 but I don’t recall the model. They both have the accutrigger. The .243 will shot a 5 shot group @ 100 yards that measures .375. The .223 shoots right at .600. I’ve been very pleased with both of these guns. I’m a big fan of Savage rifles. I have a Mod. 10 FCP- SR and a Mod 11 Scout both in .308. Both rifles shoot 1/2 MOA with custom reloads developed for both guns. Both rifles can shoot better than me. Are larger magazines available for these rifles? I have an old model 110 in 7MM Mag. Believe it or not I shot a 3/16″ group at 200 yds. with my best reloads. Also I showed up some very expensive rifles at at 400yd. range metal gong. I remain a big Savage fan. I am also a big fan of Savage rifles. I own 3. My first and favorite is a model 111, in .270. It is a very accurate rifle. I have a Ziess Conquest 3x 9 on top and I have killed many deer, whitetail and mule as well as antelope. The gun is the best gun for the money bar none. If you are looking for a “meat getter”, a Savage is hard to beat!